The BR series, new graphic recorders for the next generation, fit various applications in industrial fields to test/research fields. 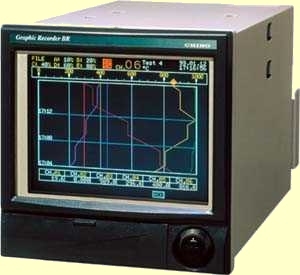 The measured data are displayed on a 5.5" TFT color LCD display, stored into the internal flash memory and can be saved to a 3.5" floppy disk. You can convert electronic data to a popular spreadsheet software by using the optional software [PASS]. The MODBUS communications link to computer systems makes the configuration with your personal computer easy. The recorders need no consumable costs including chart papers and inks used in conventional recorders. Points can be classified into maximum 5 groups and a trend screen, a data screen, a bargraph screen or a multi-screen can be displayed for each group. A historical trend screen, a real-time/historical trend screen (dual trend) or an alarm summary screen can be displayed, too. A functional jog dial allows quick selection of screens. The measured data (maximum 654,000 data) are stored in the 1.2MB internal memory by 6 kinds of storage mode. The measured data can be copied from the internal memory to a 3.5" floppy disk. Total 200 of message event and alarm event can be stored. Various kinds of screen make management and processing of the measured data easy. The historical data, which have been stored in the internal memory or saved in the floppy disk, can be displayed and compared. A search function of the specified data is provided. Two models, continuous input type (measuring cycle about 0.1 second/4-point) and standard input type (measuring cycle about 5 seconds/6-point), are offered for various applications. The interactive system on the window opened by selecting items from the menu screen allows easy programming. Using the engineering port, you can easily set up the parameters by using the parameter programming software [PASS] through a personal computer, too. Messages (maximum 30 alphanumeric characters) can be written on the trend screen. Up to 10 kinds of message can be pre-registered and written by the keyboard, communications, or remote contacts. The message can be written on the historical trend screen, too. The optional communications interface are RS-232C, RS-422A and RS-485 using the MODBUS protocol. The MODBUS communications link makes the system configuration with your personal computer. The data acquisition software [KIDS] and the parameter programming software [PASS] are optionally prepared for easy data management by your personal computer.